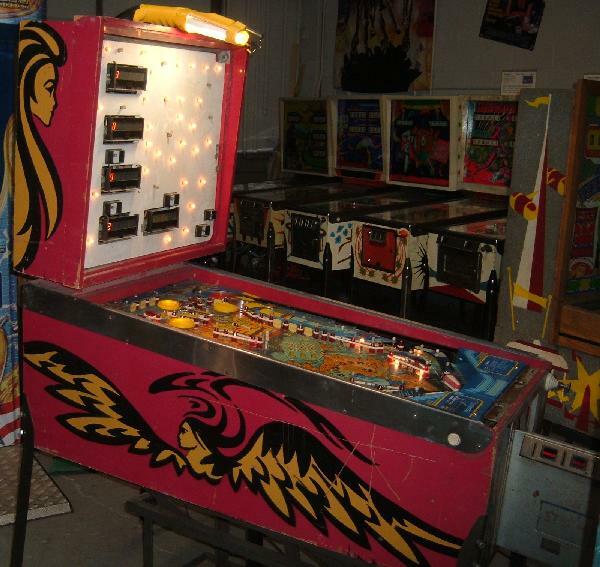 Now on to the repair itself, fixing this here 1981 Stern Free Fall pinball. This game was a bit of basket case when it came in. 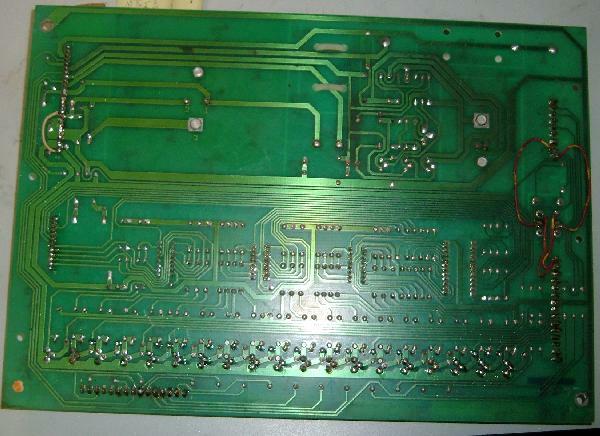 First the rectifier board in the bottom panel was missing. Frankly I can’t remember if we took it out for another game, or if it was just not there when we acquired the game. We did have an ace in the hole though, as a friend had a Stern transformer and rectifier board. The only problem was, he didn’t have the plywood that mounted the components. 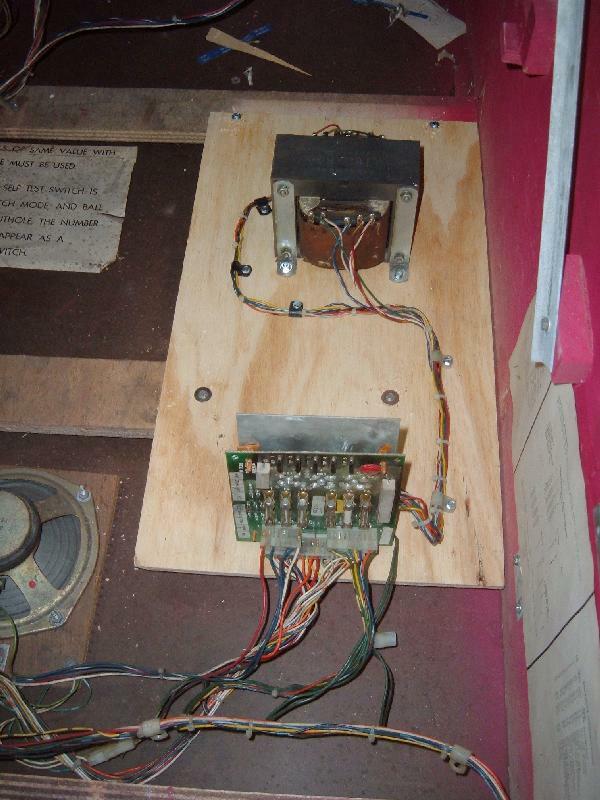 So we cut a small piece of plywood and mounted the rectifier board assembly and the transformer. 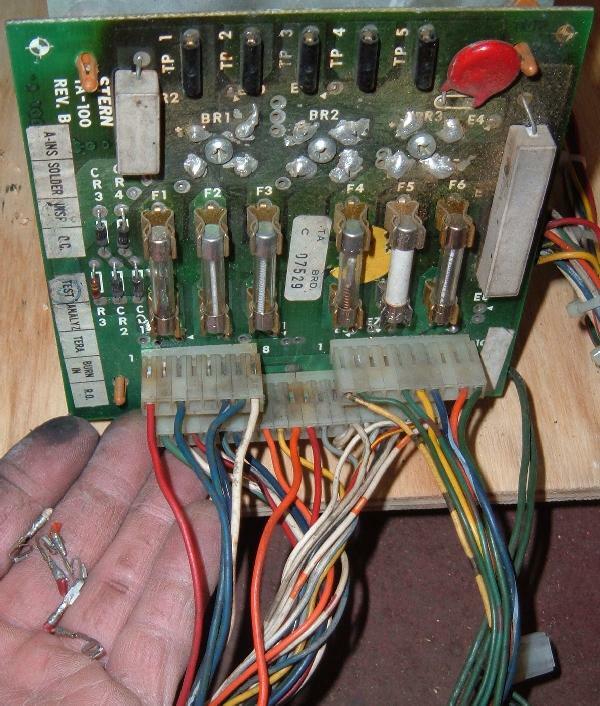 Of course the rectifier board’s connectors needed some work, they always do on these Stern games. All the “thick wires” had their female connector pins replaced with new .156″ Trifurcon pins. Also the male pins were cleaned and polished. Next up was to move to the backbox. 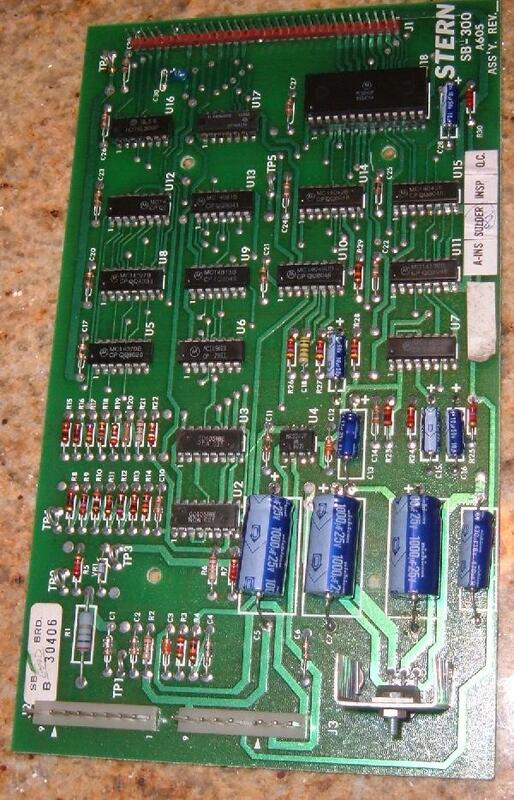 The MPU, solenoid driver board, and sound board would certainly all need work. Next moved to the solenoid driver board. Some minor work was needed on the back of the board. There were a couple burnt traces going to the flipper relay. Also from the factory the solder meniscus was cut. The meniscus is the solder mound that forms around a component lead. You should never cut into the meniscus, as it compromises the solder joint. Yet this is what happened here. A lot of components needed re-soldered to fix the cut meniscus, increasing reliability. Powered the game on and all booted and worked. Checked the +5 volts and it measured 5.26 volts at the solenoid driver board. The high voltage was working too, measuring at 180 volts. Yet the player one score display didn’t work at all. Now if you put pressure on the .156″ connector at the score display, then the display would light. 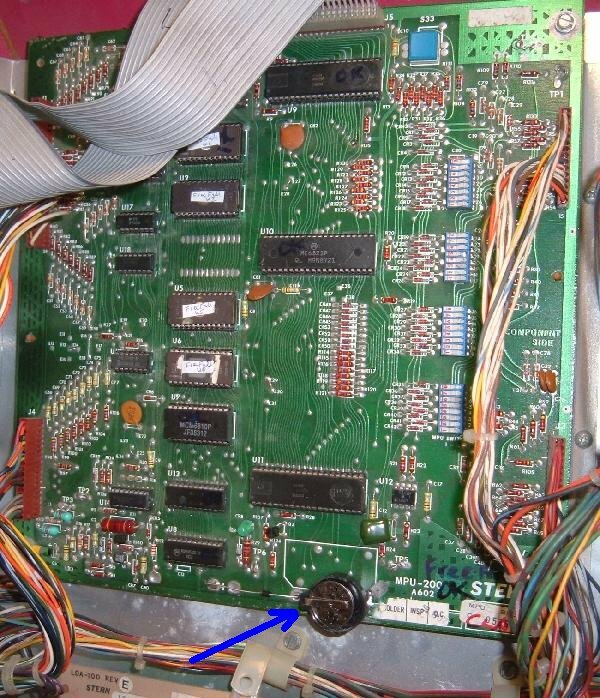 The problem was cracked solder joints on this unit, so the male connector pins were re-soldered to fix this issue. The sound board was having issues too. Though it worked, it was really noisy upon power-on. 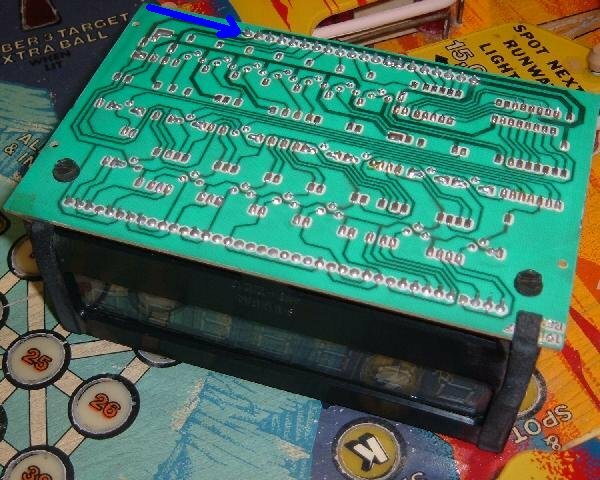 On these SB300 sound boards it’s a good idea to replace all the electrolytic capacitors, as the electrolyte dries out with time. Great Plains Electronics makes a nice cap kit for these boards. Installed one of these kits, and the sound issues went away. 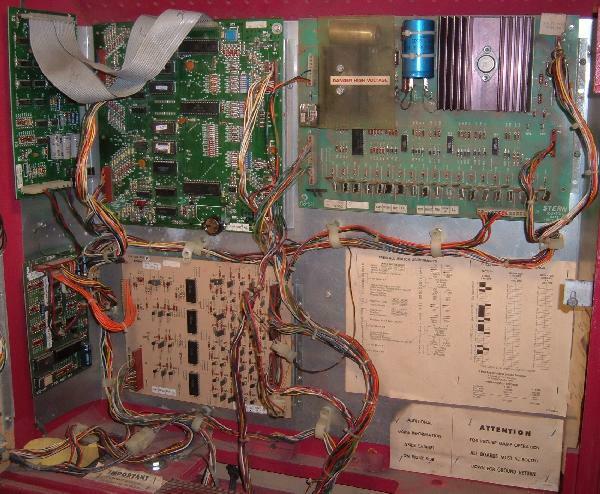 The game is now all working, but still needs to have the playfield cleaned and re-rubbered. We’ll do it, but for now, the game is working. Copyright © Michigan Pinball – We Buy Pinball Games 2019 | Michigan Pinball – We Buy Pinball Games is proudly powered by WordPress and Ani World.